Posted February 28, 2017 • filed under Resource. 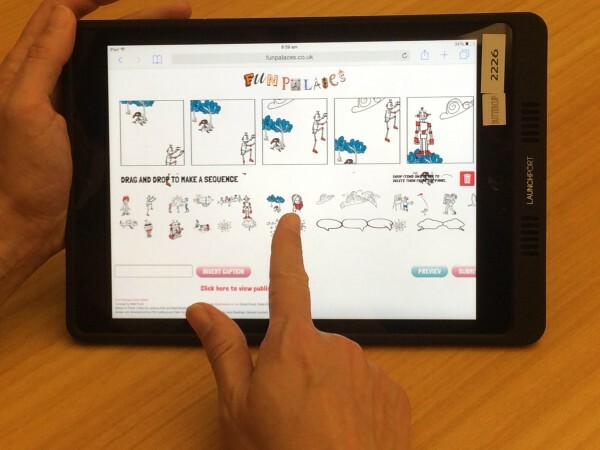 Why would an Aussie library get its designers to build a drag and drop comics website? Aren’t there already plenty of free comic makers online? What are you even playing at? Last year, Talia Yat and Phil Gullberg of the State Library of Queensland’s innovation space the Edge built the Fun Palaces Comic Maker. It was based on a comic book dice game I devised at the Manila Museum of Contemporary Art and Design in the Philippines. The maker allowed people to create their own five-panel comic strip by dragging and dropping images. These were published online as part of Fun Palaces, an annual celebration of community, arts, and science around the world. Our pilot project in 2015 encouraged users worldwide to surprise us with non-narrative comics, cheeky horror stories, and even comics in Te Reo Māori. This year, people won’t just be surprising us with their stories – they’ll be free to reimagine the project wholesale, as we’ve released the code behind the Comic Maker on Github, with the help of developer Steven Moschidis. Putting the maker on Github means the public can download the code and adapt it to create variants, add different images, or develop brand new features. The only limits are your ambition and imagination. In 2015, the Comic Maker permitted web users around the world to create stories which we couldn’t have predicted – smart, sophisticated, crude, dark, funny, twee and all points in between. This year, releasing the code behind the project opens the doorway to an understanding of “digital literacy” which is not just about consumption, or one institution’s objectives. We aim to encourage a digital future which is open, flexible, community-led, and most importantly, capable of surprising us all. So what’s all this got to do with libraries? And what are we playing at? Physical, digital, it’s all materialIt turned out that MCAD Manila had a plentiful stock of cube-shaped cardboard boxes which we were able to transform into comic book dice. Players drew on each face of their cube, rolled them like dice in teams of five, and then the teams told stories by arranging the five images that landed face up.And of course, wonderfully, the kids and teens we worked with didn’t just do as they were told. They began rearranging the cubes in other ways, creating towers and pyramids which told the stories they wanted to, in the way they wanted. The collaborative approach meant that you didn’t need to be the best at drawing, or the best performer, to contribute to the finished product. You could tell stories in English, Tagalog or any language you pleased. The aim was to juxtapose images in space and then weave a tale which linked those images. 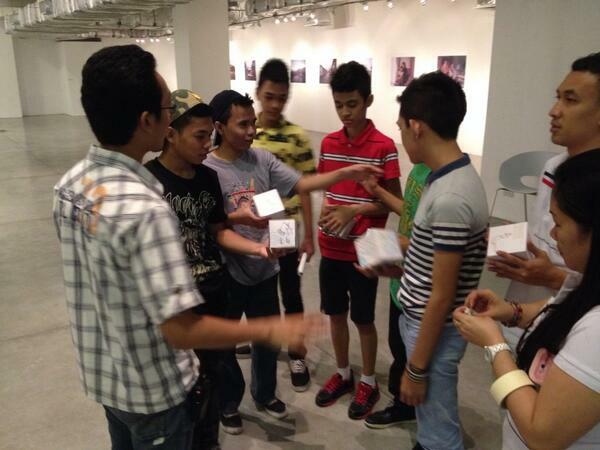 The comic maker was born from necessity – running a workshop in a modern art gallery with a bunch of Filipino kids aged from infants to teens, not all of whom spoke English. The dice game evolved into a biographical comics version based on the art of MC Escher and a text-based version intended for professional development workshops – alongside appearances at street fairs in Brisbane and London. That was great, but we also wanted to explore digital offerings with a similar degree of freedom and unpredictability. One example was a choose-your-own book review for Australian magazine The Lifted Brow, which saw you trapped between the panels of a comic book – but even that was still too constrained by authorial intent for my tastes. In the UK, I began working with Fun Palaces, an international movement which helps communities to celebrate their own talents and ambitions in the arts and sciences. On the first weekend in October every year, communities around the world take over local venues so that their friends, neighbours, colleagues, and strangers can come together and try their hand at the arts and sciences for free. The Fun Palaces manifesto “everyone an artist, everyone a scientist” chimes well with the vision of libraries as “the TARDIS on your street corner” – a public gateway to all knowledge and culture, which lets anyone, from any background, explore whatever they want to from the realm of human understanding and imagining. As part of a co-producer role on eleven simultaneous Fun Palaces in the London Borough of Lambeth, I arranged for the State Library of Queensland to build a pilot online comic maker. Some people wondered why we would do this, when there were already free comic book makers available online. We turned the question around. This was about process, not product – the aim was not to build the best comic maker in the world in a matter of weeks during late 2015. It was to invite the community to join a conversation and use our resources – much as we like them to use our collections! If libraries offer creative play, storytimes, makerspaces, and, yes, Fun Palaces in physical locations – why don’t they do that online too? Encouraging the library’s web team to design this game meant acknowledging their creativity and capacity to do amazing and innovative things beyond “business as usual” – because good work, in any sector, means respecting your team’s ability to innovate and think for themselves. Releasing the code behind the Comic Maker meant that we were empowering the community – in the very broadest sense of “all web users” – to play with the infrastructure as well as the content of our digital offering. The essence of a library project is that it’s not meant to teach, preach, or fulfil the requirements of a curriculum: it’s meant to open doors for people to learn and create on their own terms. Comparing it to existing free cartoon makers is like saying we don’t need libraries because we have Amazon and e-books. Games have their own art historyBut the truth is more complex: digital and physical traces are interwoven in the Maker’s history, going back through its comic-game forefathers.These images came from Jessica Abel and Matt Madden’s Panel Lottery, an exercise to help people devise their own comics.McCloud had devised a game called 5-Card Nancy, where players laid out individual panels from the Nancy comic strip as playing cards. The aim is to create a five-panel comic, with players voting to decide if each panel is judged worthy to continue the story. McCloud pays tribute to the Surrealist game Exquisite Corpse in his account of 5-Card Nancy’s origins, but he also acknowledges a Usenet post written in the 1990s by Barry Deutsch. The comic maker of 2016 traces its history back through physical comics to the Surrealists, to the iconic Nancy cartoon, and back once again into digital space, and the early days of open-ended Internet discussion. However, games have their own art history – Abel and Madden were inspired in turn by the work of Scott McCloud, whose Understanding Comics remains one of the defining studies of the medium. The original Comic Book Dice challenged players to tell stories using three simply drawn characters: a tall person, a short person, and a penguin. We’re always so attracted by new and shiny things. With the current vogue for everything digital, it would be fun to hold up the Comic Maker as a bright example of 21st century library outreach. US librarian Justin Hoenke compares libraries to video game platforms: if they host storytimes and makerspaces within their walls, stock fiction on their shelves, and participate in events like Fun Palaces that embrace the whole community, then you should expect to find playful as well as pragmatic offerings in digital library spaces too. Stories like that make me smile. So often people marvel at the novelty of 21st century libraries being about more than books, or we have to battle against dumb detractors who think that digital media has somehow removed the need to support public access to knowledge and culture. I live just down the road from a suburban Brisbane play area called Bedford Playground. It was founded in 1927 after a number of children had been injured playing in the crowded, dirty streets of Spring Hill. Take your next step here.